Ham is the thigh and rump of any animal that is slaughtered for meat, but the term is usually restricted to a cut of pork, the haunch of a pig or boar. Ham is a compact source of animal protein and an excellent source of calcium, iron, niacin, phosphorus, riboflavin, and thiamine. Although it can be cooked and served fresh, most ham is cured in some fashion. The curing process both preserves the meat allowing it to be stored, or brought on travels for later consumption, as well as giving it additional flavor. The distinctive flavor of particular varieties may come from the curing process or from the diet fed to the pigs. Ham has been a common and popular meat throughout European and Asian civilizations, except where forbidden by religious prohibitions, and was introduced to the North American continent by the first European settlers. 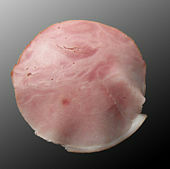 Today, ham continues to be a favored food, with many regional varieties now available worldwide. While some faiths continue to prohibit eating ham, as a product of the pig, Christian holidays often feature ham as the main dish. Thus, ham has both contributed to the health and welfare of human society, by its use as a preserved and versatile form of nourishment, and to barriers and even conflict between groups, due to the differences in religious viewpoint regarding its consumption. Although fresh ham may be prepared and sold for consumption without curing, the majority of hams are cured. Ham can either be dry-cured or wet-cured. A dry-cured ham has been rubbed in a mixture containing salt and a variety of other ingredients (usually some proportion of sodium nitrate and sodium nitrite), Sugar is common in many dry cures in the United States. This is followed by a period of drying and aging. Dry-cured hams may require a period of rehydration prior to consumption. A wet-cured ham has been cured with a brine, either by immersion or injection. The division between wet and dry cure is not always hard-and-fast as some ham curing methods begin wet but are followed by dry aging. The majority of common wet-cured ham available in U.S. supermarkets is of the "city ham" or "Urban-style" variety, in which brine is injected into the meat for a very rapid curing suitable for mass marketing. Traditional wet curing requires immersing the ham in a brine for an extended period, often followed by light smoking. Traditional wet cured ham includes the English Wiltshire ham and the French Jambon de Paris. Hams may be ready to eat or require cooking. Fresh hams must be cooked by the consumer before eating. Ready-to-eat hams include prosciutto and cooked hams. Cooked, vacuum-packaged and canned hams can be eaten cold just as they come from their packaging. Such hams are often purchased sliced and are convenient for use in sandwiches. However, cooked hams can also be reheated, especially when whole, and served as the main dish in a meal. Ham is also processed into other meat products such as Spam luncheon meat. 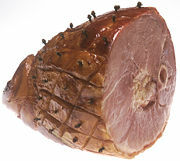 Ham is served hot or cold in a variety of ways together with other food items such as bread, salad, cheese, condiments such as mustard, and so forth, making it one of the most versatile sources of meat protein. On the other hand, Christians often eat ham at their religious holidays. Ham is a traditional dish served on Easter in predominantly Christian countries. 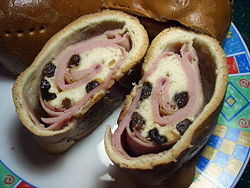 A Christmas Ham or Yule Ham is a traditional dish associated with modern Christmas, Yule, and Scandinavian Jul. tradition [that] was initiated in all probability on the Isle of Britain by the Anglo-Saxons, although our knowledge of it comes substantially from medieval times…. [In ancient Norse tradition] sacrifice carried the intent of imploring Freyr to show favor to the new year. The boar's head with apple in mouth was carried into the banquet hall on a gold or silver dish to the sounds of trumpets and the songs of minstrels. Saint Stephen may have inherited some of Freyr's legacy. His feast day is December 26 and thus he came to play a part in the Yuletide celebrations which were previously associated with Freyr. In old Swedish art, Stephen is shown as tending to horses and bringing a boar's head to a Yuletide banquet. Both elements are extra-canonical and may be pagan survivals. Ham is produced around the world, with regional variations on the method. Well-known varieties include Italian prosciutto and the Spanish Jamón serrano and jamón ibérico. The United States has country ham, which might or might not be smoked. England has York ham and Wiltshire ham. Germany's Westphalian ham is usually smoked over juniper, in Belgium there is the dry-cured, smoked Ardennes ham. In Iran, the dry-cured Zard Kūh ham is produced. Elenski but (Bulgarian: еленски бут or (more precisely but less commonly) бут по еленски, sometimes translated as Elena round or Elena leg) is a dry-cured ham from the town of Elena in northern Bulgaria and a popular delicacy throughout the country. The meat has a specific taste and can be preserved in the course of several years, owing much to the special process of making and the climatic conditions of the part of Stara Planina where Elena is located. The legs and quarters of the pig, traditionally singed and scraped, are taken from the body. Later the redundant parts are removed, so that the remaining meat is protected by hide or the skin that surrounds the muscle tissue. After the legs are shaped, they are well salted and put at the bottom of a postav, a special type of barrel designed for the occasion. The delicacy traditionally remains in salt for 40 days, then is taken out and left to dry. There are various preservation technologies used to prepare elenski but that typically vary considerably from family to family, as opposed to regionally. In the past, the rounds were put in well trampled upon maize meal or processed with lime milk. The meat could also be stored in specially sewn bags of cheesecloth or wooden containers with thick nets instead of walls (muharnik), but as a rule it is put somewhere airy, where the clear mountain air could aid the drying and conservation, and also in order to prevent houseflies from laying eggs on the rounds. In the past, in many of the small towns around Elena the rounds were stored in the rooms where the daily house fire was lit, so that a certain amount of smoking could be achieved in order to add flavor. Jinhua ham is a type of dry-cured ham named after the city of Jinhua, where it is produced, in Zhejiang province of China. This type of ham has been known since the Song dynasty, and is highly regarded in Chinese cuisine. It may be eaten as part of a cold meat dish or used in producing soup stock, imparting its unique and umami (savory) flavor to any dish. Jinhua ham is an important ingredient in the dish Buddha jumps over the wall. The ham has been lauded in classical Chinese literature. The ideal Jinhua ham should have certain physical characteristics such as shiny and smooth yellow outside, a rounded shape in the style of a bamboo leaf, small joint and hoof, a thin and slender bone, an abundant layer of fat surrounding dark and red toned meat, a pronounced but not unpleasant odor, a fine textured meat with high levels of intramuscular fat, and a taste that is highly salty, umami, and sweet. The outside of the ham may have small amounts of mold but this is considered normal and thought to contribute to the flavor of the ham. Britain has a long tradition of smoking, curing, and pickling hams. Most regions have their own type of ham, each with a slightly different taste due to the varying preparation methods. York Ham traditionally comes from the Large White pig which is a popular commercial breed in the North East of England. The ham gets its distinctive rich salty flavor and dry texture from the way that it is salt-cured and matured over a period of at least ten weeks. It can be eaten raw but is often boiled in the same manner as a country ham. The curing process means that the York is somewhat drier and saltier than the Wiltshire ham. Wiltshire Ham is made using an old, traditional method of curing whereby the pork leg is immersed for several days in brine, which produces its moist texture. It is traditionally cured with bacon and molasses (or unrefined brown sugar), which produces a mild, sweet tasting ham. 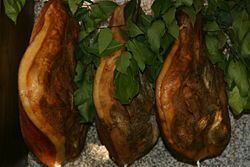 In France, Jambon is a popular meat and has several regional variations. Jambon de Paris is a wet-cured, boneless ham and baked in shape. Using only the finest farm raised pork, Jambon de Paris is a superior quality ham made according to the traditional French charcuterie recipe for cooked ham. It is high in flavor, but low in salt. Bayonne Ham or Jambon de Bayonne is an air dried salted ham that takes its name from the ancient port city of Bayonne in the far South West of France (Le Pays Basque or the Basque country). The drying method used in modern times mimics that used in the past. Each drying storage chamber has temperature and humidity controls set to match seasonal variations. Originally the pigs were slaughtered in late October to early November. The hams were then rubbed in salt produced in the salt pans of the Adour estuary or from those near Bearn. The temperature conditions at this time of year, 6 to 8 °C, are ideal for the initial preserving process and the hams were left hanging in the drying room until the end of January or early February. Mark applied to each Bayonne ham. In the next part of the process, a mixture of pork fat and flour called 'pannage' is used to seal the cut end of the joint. This reduces the speed in which the meat dries out during the warmer months of March, April, and May. At some point during this time many of the producers will also rub a paste of Piment d'Espelette into the skin, giving a unique tang to the end product. The final drying stage is completed by the end of July and the ham is ready. Modern techniques using individual drying chambers with temperature and humidity controls simply reproduce the seasonal temperatures and the changing humidity conditions produced each year by the foehn (southerly wind) and the Atlantic Ocean. 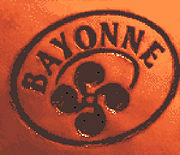 Once the ham has completed its curing process it is marked with the traditional Croix Basque or Lauburu topped with the name Bayonne. The ham is a minimum of 7 months old, with most being 9 or 10 months before it is offered for sale, and it will keep for up to another year if kept in a cool (8 °C), dry atmosphere. The result is a slightly sweet, delicately flavored, moist meat with very little salt to the taste, which, if cut thinly, is almost translucent. Schinken is also popular in Germany, where it is generally smoked. Westphalian ham is created from pigs raised in the Westphalian Forest and fed acorns. The resulting meat is dry cured and then smoked over a mixture of beechwood and juniper branches. Black Forest ham, or Schwarzwälder Schinken, is a variety of smoked ham produced in the Black Forest region of Germany. Black Forest ham has a very pronounced flavor and is common in German cuisine. It may be eaten fresh, for example on bread or with fruit, or used as an ingredient in cooked dishes. Black Forest ham is seasoned, dry cured, and then smoked over sawdust and fir brush, a process that can take up to three months. Raw ham is salted and seasoned with garlic, coriander, pepper, juniper berries and other spices. After curing for two weeks, the salt is removed and the ham cures for another two weeks. Next, the ham is cold smoked at a temperature of 25° C (77° F) for several weeks, during which time the ham acquires its deep red color. The smoke is created by burning fir brush and sawdust. The smoking process gives the ham much of its flavor. 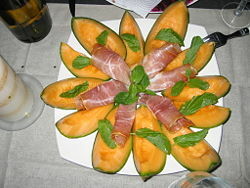 In Italy, ham is called prosciutto, and can be either raw (prosciutto crudo) or cooked (prosciutto cotto). The earliest evidence of ham production in Italy comes from the Republican Roman period (400-300 B.C.E.). Modern Italian and European Union legislation grants a protected designation of origin to several raw hams, which specify where and how these types of ham can be produced. Today, Parma ham, the so called Prosciutto di Parma, has almost 200 producers concentrated in the eastern part of the Province of Parma. Its production is regulated by a quality consortium that recognizes qualifying products with distinctive mark. Only larger fresh hams are used (12-13 kilograms). Curing uses relatively little salt, but can include garlic salt and sugar producing a sweeter meat. After salting, the meat is sealed with pig fat over the exposed muscle tissue, which slows drying. Curing occurs over a minimum 12 months. This curing method uses only salt, without nitrates and without spices. No conserving substances are added. San Daniele ham (Prosciutto di San Daniele) is the most similar to Parma ham, especially the low quantity of salt added to the meat, and is the most prized ham. Other raw hams include nostrani, nazionali, and toscani. They are more strongly flavored and are produced using a higher quantity of salt. 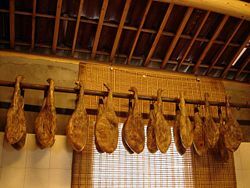 In Portugal, besides several varieties of wet-cured hams called fiambre, the most important type of ham is presunto, a dry-cured ham similar to Spanish jamón and Italian prosciutto. There is a wide variety of presuntos in Portugal; among the most famous are presunto from Chaves and presunto from Alentejo, which is made from Black Iberian Pig. Jamón refers to a dry-cured ham from Spain. These hams were known as a delicacy even in the days of the Roman Empire. There are two primary types of jamón: Jamón serrano (meaning ham from the sierra or mountains) and Jamón Ibérico (ham from the Black Iberian Pig). Jamón serrano (literally mountain ham) is generally served raw in thin slices, similar to the Italian prosciutto. The fresh hams are trimmed and cleaned, then stacked and covered with salt for about two weeks in order to draw off excess moisture and preserve the meat from spoiling. The salt is then washed off and the hams are hung to dry for about six months. 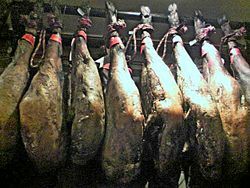 Finally, the hams are hung in a cool, dry place for six to eighteen months, depending on the climate, as well as the size and type of ham being cured. The drying sheds (secaderos) are usually built at higher elevations, which is why the ham is called mountain ham. The majority of Serrano hams are made from Black Iberian Pigs, but are not to be confused with the much more expensive Jamón Ibérico. Cebo or Campo hogs are fed only commercial feed. Recebo hogs are raised on commercial feed and fed acorns for the last few months of their lives. Bellota hogs are fed a diet almost exclusively of acorns (bellotas). The term pata negra is also used to refer to jamón ibérico in general and may refer to any one of the above three types. Jamón Ibérico, which only accounts for about 8 percent of Spain's cured-ham production, is very expensive and not widely available abroad. Fresh ham is an uncured hind leg of pork. Country Ham is uncooked, cured, dried, smoked-or-unsmoked, made from a single piece of meat from the hind leg of a hog or from a single piece of meat from a pork shoulder. Smithfield ham, a country ham, must be grown and produced in or around Smithfield, Virginia, to be sold as such. For most other purposes, under US law, a "ham" is a cured hind leg of pork that is at least 20.5 percent protein (not counting fat portions) and contains no added water. However, "ham" can be legally applied to such things as "turkey ham" if the meat is taken from the thigh of the animal. If the ham has less than 20.5% but is at least 18.5 percent protein, it can be called "ham with natural juices." A ham that is at least 17.0 percent protein and up to 10 percent added solution can be called "ham—water added." Finally, "ham and water product" refers to a cured hind leg of pork product that contains any amount of added water, although the label must indicate the percent added ingredients. If a ham has been cut into pieces and molded, it must be labeled "sectioned and formed" or "chunked and formed." In addition to the main categories, some processing choices can affect legal labeling. A 'smoked' ham must have been smoked by hanging over burning wood chips in a smokehouse, and a "hickory-smoked" ham must have been smoked over hickory. Injecting "smoke flavor" is not legal grounds for claiming the ham was "smoked." Hams can only be labeled "honey-cured" if honey was at least 50 percent of the sweetener used and has a discernible effect on flavor. So-called "lean" and "extra lean" hams must adhere to maximum levels of fat and cholesterol per 100 grams of product. Turkey ham, a boneless product made from pressed dark thigh meat of a turkey is a popular low-fat alternative to traditional ham. A spiral-slicing process has become popular for boneless hams sold by delicatessens. Country ham is a variety of cured ham associated with the Southern United States. It is typically very salty in taste. Country hams are salt- and nitrate-cured for about a month and may be hardwood (usually hickory and red oak) smoked, then aged for several months to a year. Smoking is not legally mandated for making country ham. Some types of country ham (such as the "salt-and-pepper ham" of North Carolina) are not smoked. The smoking process turns the meat a much redder color than other hams. They are usually sold in stores unrefrigerated as whole bone-in hams packaged in rough cotton bags, with identifying markings printed on the bags. Country ham is also sold in ready-to-cook pre-soaked, pre-sliced packages, usually vacuum-packed plastic sheets. Whole country hams must be scrubbed and soaked for many hours prior to consumption in order to remove the salt cure and mold, otherwise they will be much too salty to eat. Even when soaked properly, they are still quite salty. There are several methods of cooking a country ham. They include slicing and pan-frying, baking whole, and simmering for several hours (in several changes of water), followed by baking whole. Country ham is often served in restaurants as an entree as a whole slice, often with the femur cross-section left in. It is also commonly served sliced and then cut into pieces to be used in sandwiches made of buttermilk (or similar) biscuits, sometimes with butter or red-eye gravy. Smithfield ham is a specific form of the country ham, a product which originated in the Town of Smithfield in Isle of Wight County in the Hampton Roads region of Virginia. It is one of the most popular and expensive hams in the United States is Smithfield or Virginia ham. Through a special curing process Smithfield ham ages. In that time a fungal coat forms over the outside of the ham while the rest of the meat continues to age. This process produces a distinctive flavor, but the fungal layer must be scrubbed off of the ham before being cooked or served. ↑ Ham Varieties and Terminology about.com Retrieved May 13, 2008. ↑ James E. Spears, "The 'Boar's Head Carol' and Folk Tradition." Folklore, 85, 3 (Autumn, 1974): 194-198. JSTOR. Retrieved May 25, 2008. ↑ Pamela Berger. The Goddess Obscured: Transformation of the Grain Protectress from Goddess to Saint. (Boston, MA: Beacon Press, 1985, ISBN 0807067237), 105-112. ↑ Bulgarians that are unfamiliar with the delicacy sometimes think, misled by its name, that it is prepared from venison and not pork. This is because the common meaning of the Bulgarian adjective elenski is deer's, while in this case it is used to denote the town of Elena. When the less popular name бут по еленски is used, this confusion is mostly eliminated. ↑ Schwarzwälder Schinken Die Herstellung. (in German) Retrieved May 20, 2008. ↑ About Jamon Serrano Jamon.com Retrieved May 20, 2008. ↑ Turkey Ham recipetips.com Retrieved May 20, 2008. ↑ Logan Farms Patents & Press Releases: Benefits to the Franchisee of Logan Farms Spiral Slicing Technologies Retrieved May 20, 2008. This page was last modified on 25 July 2017, at 21:25.